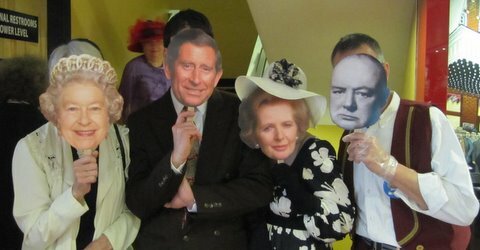 The Books for Walls Project: BREAKING NEWS: The Royal Family in Traverse City!? BREAKING NEWS: The Royal Family in Traverse City!? Kate Middleton (The Big Sister), Sarah Ferguson (The Mom), Prince Charles, (The Sister's Uncle), The Young Victoria --the actress Emily Blunt who played Victoria (The Little Sister), Winston Churchill (The Poet) and Margaret Thatcher (The Bean). The Sisters have been learning all about the world and lately have focused on current events: The Royal Wedding. Today we attended a viewing of The Royal Wedding live on the big screen at our favorite local hot spot --The State Theatre. To make the event even better attendees were urged to dress up: "Uniform, morning coat or lounge suit, please. And every English lady wears a hat to a wedding." 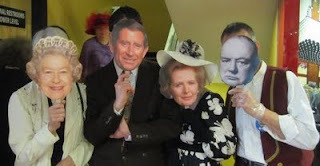 The Sisters' Uncle thought up, made and delivered the fantastic mask idea (we do love to go incognito!) And The Sisters are up for any and every occasion to dress up --so we got serious-- even though it meant rising at the ridiculous hour of 3:30am!! The Poet volunteered --arriving, by bicycle at 3:30am, now that is dedication! He and fellow volunteer cut the "TC version of Prince William's Groom's Cake" as a cameraman filmed the action. 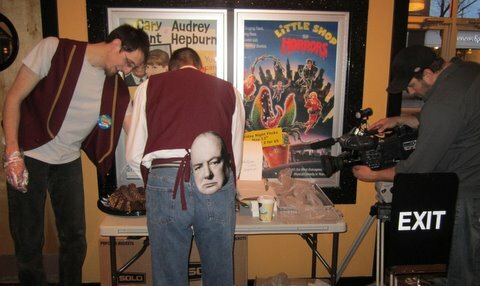 We love the way he kept Winston Churchill in his back pocket! 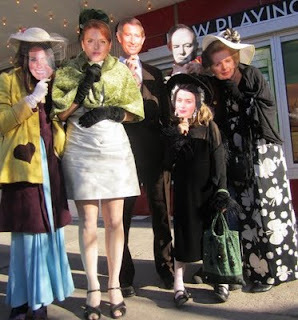 While there are a multitude of opinions about the Royal Wedding --one thing is for certain the folks gathered to view the affair were treated like royalty by a committed group of volunteers and the ever-inspiring staff of Traverse City's State Theatre. Thanks to everyone who took part, we will never forget the event! Next Week: Choose Privacy Week, A Royal-ish Challenge --coming Wednesday! RIGHT Now: Take this week's Challenge and Celebrate National Poetry Month all year --learn more here. Have a great weekend! Thanks for posting info about keeping comments open.